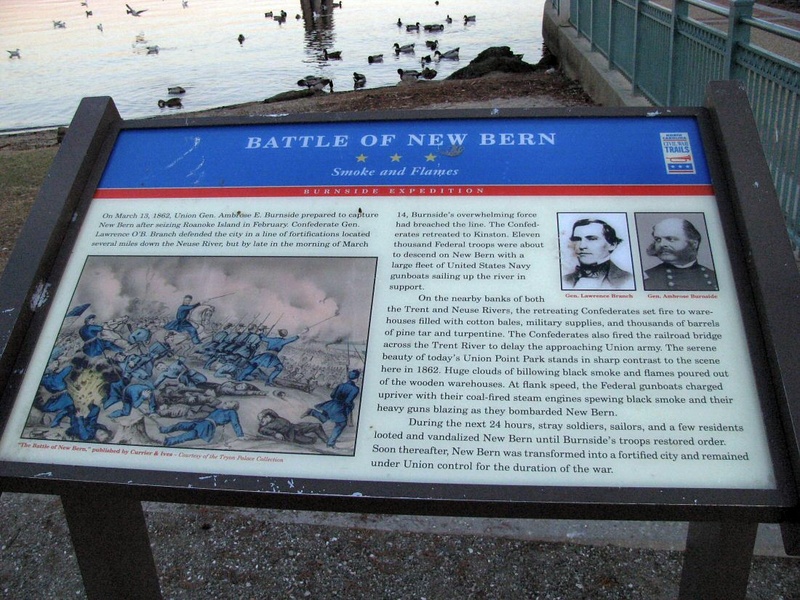 Occupation of the City of New Bern (spelled New Berne at the time) by Union troops essentially cut off rail and naval supply lines to the North, isolating the Confederate Army of Virginia. Founded in 1710, New Bern, North Carolina, is the second-oldest city in the state, founded by German and Swiss adventurers. Prior to the American Revolution, Royal Gov. William Tryon made this seaport his colonial capitol and commissioned the construction of Tryon Palace in 1770. By August 1861, the Union army had secured the Pamlico Sound inlets after defeating the Confederate forces and capturing Forts Clark and Hatteras. By winter 1862, Gen. A. E. Burnside and Commodore L. M. Goldsborough had seized the Confederate positions on Roanoke Island and New Berne (as it was originally spelled). Union control of the inner coastal position tightened the blockade of the North Carolina coast, but the state didn't capitulate until April 26, 1865, when Gen. Joseph Johnston surrendered the last major Confederate army to Gen. William T. Sherman near Durham, North Carolina. 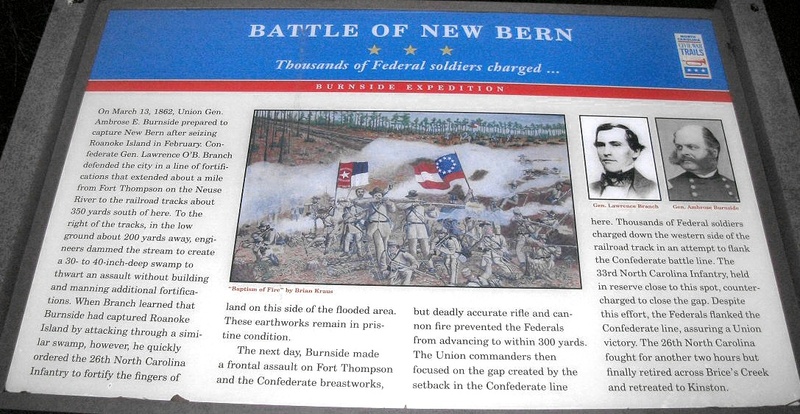 The Battle of New Berne, as it was known then, was fought on March 14, 1862, near the city of New Bern, as part of Burnside's North Carolina Expedition. On March 11, Brigadier General Ambrose Burnside’s command launched from Roanoke Island to rendezvous with Union gunboats at Hatteras Inlet for an attack on New Bern. The defending Confederate commander was Brigadier General Lawrence Branch. 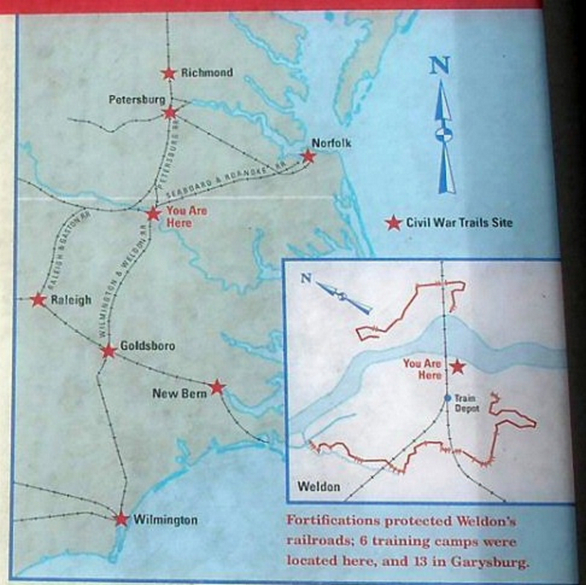 On March 13, the fleet progressed the Neuse River and disembarked on the river's south bank only a few miles from the city's defenses. On March 14, three brigades under John G. Foster, Jesse L. Reno and John G. Parke attacked along the railroad and drove the Confederates out of their fortifications. The Federals captured nine forts and 41 heavy guns, and despite several Confederate attempts to retake the town, it remained a Union occupied base until the end of the war. The ensuing occupation of the City of New Bern essentially cut off rail and naval supply lines to the North, isolating the Confederate Army of Virginia. New Bern National Cemetery was officially established Feb. 1, 1867, and many of the burials at New Bern are reinterments of remains from the surrounding area, including Beaufort, Hatteras and locations along the coast. Over 1,000 unknowns are buried in a separate section. New Bern National Cemetery was listed on the National Register of Historic Places in 1997.